What is "Project Fiscal Sponsorship"? As a public charity that is tax-exempt under Internal Revenue Code Section 501(c)(3), Southern Conservation Partners can legally and properly conduct a program of support to individuals and nonexempt organizations. SCP assists projects led by others that are deemed by SCP to be in accord with and supportive of its own mission to save, honor, and enhance the natural heritage of the southern United States. SCP can choose to support a project financially, in circumstances when project leaders need a 501(c)(3) public charity sponsor to receive funds and pass them on to the project. SCP must approve each project and will maintain complete discretion and control over funds donated or granted in support of the approved project. As fiscal sponsor, SCP takes care of the fiduciary and administrative aspects of managing funds that have been contributed for a project so that its leaders can focus on project activities and strategies. Fiscal sponsorship of an approved project will most often, if not always, be temporary and either for the limited term of the project, or until such time when the project organizers obtain their own tax-exempt corporate status. 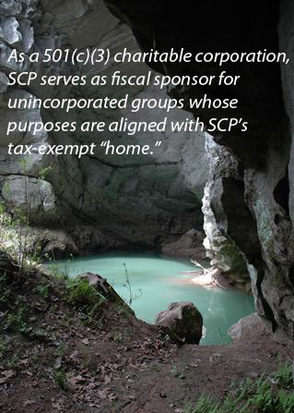 Occasionally SCP may consider managing the financial affairs of a smaller organization that has already established its own 501(c)(3) public charity corporate status. This sponsorship mechanism enables groups to undertake projects that match the mission of Southern Conservation Partners (to conserve, protect, honor, and enhance the natural heritage and environmental assets of the southern U.S.) without having to incorporate. Project fiscal sponsorship of approved and accepted projects is a central program element of Southern Conservation Partners. Southern Conservation Partners provides fiscal sponsorship for the North Carolina Biodiversity Project through a limited partnership arrangement. SCP helped secure funds in support of this project. The NCBP team is composed of volunteer conservation biologists, taxonomic experts, nature photographers, and amateur naturalists with decades of experience studying the state’s native fauna and flora. The NCBP is dedicated to increasing public awareness and appreciation for the state’s diversity of species and ecosystems, as well as their conservation needs. To promote these goals, the NCBP has created a series of publicly accessible websites (hosted by the State of North Carolina’s Division of Parks and Recreation) that provide checklists, photo images, life histories, and conservation information for the state’s wide range of species. Each taxonomic website is managed by a team of volunteers. Southern Conservation Partners in 2018 initiated an assistance agreement with North Carolina's state Natural Heritage Program that we hope will grow and continue into the future. The initial NHP project for which SCP provided financial assistance aided in the process of formally recording notice of articles of dedication for more than 190 State-owned nature preserves with Counties' Registers of Deeds in 77 (of the 100) North Carolina counties in which dedicated nature preserves are located. We are grateful to the Felburn Foundation for providing financial assistance for this pilot project. In the next phase of our assistance to the NC Natural Heritage Program, SCP is financially subsidizing costs incurred by volunteers helping with monitoring of some of the more than 530 dedicated nature preserves and registered natural areas across North Carolina. Southern Conservation Partners initiated a process of dialogue among private conservation and environmental protection organizations and federal-state-and local public agencies to form a coalition concerned for protection and restoration of water quality, water resources, and the water-dependent biota and environmental assets of the French Broad River and all its tributary streams in western North Carolina. Diminished water quality in the river and its tributary steams is threatening the basis of that region's economy: its natural capital. With generous grant funding from the New Belgium Brewing Company, SCP in 2016 initially provided fiscal sponsorship for the Ecological Services and Markets group to conceptualize a process to define the economic importance and values of the river's water quality and to build a long-term, privately-supported funding source to protect and restore the natural resources of the watershed. ​ In January 2017, Southern Conservation Partners, in partnership with the Southeastern Partnership for Forests and Water, convened 45 people representing 28 public and private organizations for initial discussion about the benefits of forming a coalition for the purpose of protecting and restoring the water resources and conserving lands critical to water quality in the upper French Broad River Basin. After reaching general consensus in that forum, an initial steering committee/task force was formed to take action steps toward forming a partnership for watershed protection. In 2018, the French Broad River Partnership formally organized as a coalition of dozens of public agencies and private organizations working together in collaboration to maintain and improve stream health and water quality within the entire French Broad River Watershed. The partnership recognizes that the river watershed is the essential source of public drinking water and recreation while supporting biodiversity, agriculture, forestry, and economic growth. Southern Conservation Partners in 2016 partnered with Picture Farmer Films, LLC, to serve as fiscal agent for production of the film, "Saving Place, Saving Grace." The documentary film, narrated by Martha Teichner of CBS Sunday Morning, portrays land conservation and ecological restoration and stewardship at the Holy Cross Abbey, a Trappist monastery in Virginia’s Shenandoah Valley. As an expression of responsible stewardship, and in honor of the intersection of ecology and theology, the Abbey has placed a permanent conservation easement over much of the monastery land, along with other notable initiatives in sustainability. "Saving Place, Saving Grace" debuted on Virginia Public Television on January 12, 2017. VIEW this excellent documentary and its moving message (also on Virginia Public Television and YouTube). Learn more about the film and watch a trailer. An intensive inventory of surviving tracts of privately-owned longleaf pine dominated forest tracts in the NC Sandhills region was conducted by conservation biologists/planners on staff of the NC Natural Heritage Program, before dramatic funding and personnel reductions to that program. This project continued this inventory in 2017 and was funded through a Southern Conservation Partners contract with The Nature Conservancy.